In 2008-9 The National Gallery London (NGL) hosted Renaissance Faces, an exhibition traversing the evolution of portraiture across Europe between the fifteenth and sixteenth centuries. The exhibition had an accompanying DVD and catalogue - the latter of which has recently been issued in paperback format via Yale University Press. Reviewers can often be flippant about catalogue volumes, particularly those containing little more than an inventory of the exhibition in question. In this instance however, preceding the catalogue entries are poignant essays on different aspects of Renaissance portraiture. These collectively transform this volume into a valuable resource on this topic. It is thrilling to discover evidence of domestic life not unlike our own buried many centuries ago - especially thrilling when it is mingled with much that is strange. In the same way, it should be exciting in this exhibition to find the familiar coexisting with the alien. The list of contributors is impressive. Those familiar with Renaissance scholarship will recognise many of these names at a glance. For others, the credentials of the authors are not as important as their style of presentation. In each instance, it was refreshing to encounter succinct, purposeful writing in accessible language. The essays examine different aspects of portraiture - its social, historical and functional purpose, as well as technical processes involved in their creation. Although these pieces do not overlap by design, there are numerous parallels to be drawn between each theme, particularly exploring the interplay between artist and patron, and the depiction of a realistic versus idealised likeness. The greatest revelation of this catalogue was its extension to cover portraiture in a wide range of media. Whilst paintings make for the majority of the works presented, there are also some wonderful examples of drawing, engraving, sculpture, and medallions/coinage featuring likenesses, each with a fascinating history. The subtitle of the exhibition, and an undercurrent in the catalogue was Van Eyck to Titian - indicating the sweep of time represented by the fifteenth and sixteenth centuries - where portraiture departed from its Medieval forms and became part of the repertoire of artists now in demand to do more than decorate public and sacred spaces. This humanistic shift is explored at length, and is fascinating to track across the corners of Europe. Particularly intriguing to note are the portrait medals which became popular in Italy - often directly quoting coins of ancient origin. The catalogue listings are accompanied by thorough descriptions. Each entry is nicely illustrated with images of varying size, but also presented with a summary of relevant iconography and bibliography. 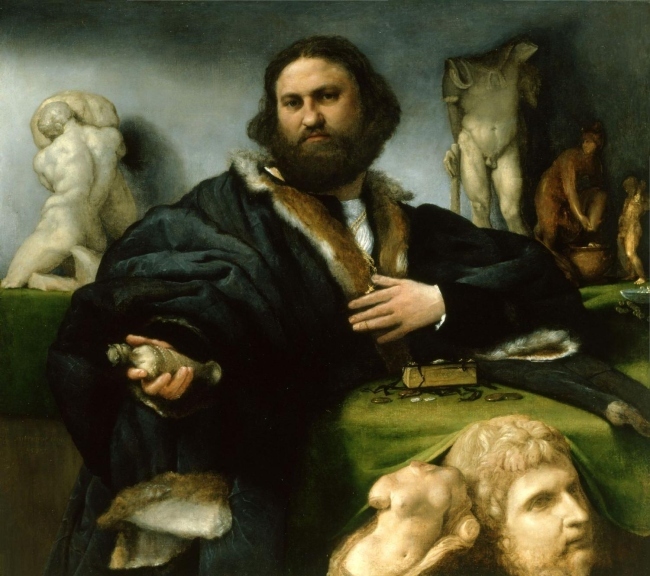 One such description that became quite memorable is that which accompanies Lorenzo Lotto's portrait of Andrea Odoni, a noted collector of antique sculpture. What may present as straightforward portrait of a collector among his possessions is actually a rich iconographical construct, deliberately crafted by Lotto to include elements of the Odoni Collection, but also a reference to the Lotto's own experiences with Raphael, including his exposure to fragmentary sculptures of Hercules and Anataeus and The Emperor Commodus as Hercules (the larger white marble pieces behind Odoni). Odoni himself holds a small figurine of Diana of Ephesus, also quoted by Raphael adorning his Philosophy fresco in the Stanza della Segntaura. Other observers (see Abrahams) have noted the similarities between a Lotto self-portrait and the head of Hadrian in particular. Comparing these seemingly disparate viewpoints, both actually are in agreement that this work is as much about the ingenuity of Lotto as it is about the collection of a wealthy Venetian. This volume can be divided into two discrete sections: The first segment is a presentation of four essays. The second is the catalogue proper, divided into themes such as Family, Courtship and Friendship, and Love and Beauty. The four essays firmly establish this volume a viable resource long after the exhibition has ended. Each essay has a different focus, exploring the complexities of portraiture beyond its art historical context. I found Luke Syson's piece, Witnessing Faces, Remembering Souls the most fascinating. Syson is a curator at the NGL and was responsible for the acclaimed 2007 exhibition focusing on Renaissance Siena (which has an equally compelling catalogue volume). Syson's writing is engaging and speaks in a universal language, as opposed to the more scholarly offerings by Lorne Campbell or Miguel Falomir. Recalling Syson's piece in the Guardian, calling on museums to appeal to the heart, he seems interested in exploring the social dynamics of a given era and how these come to be represented in art. Syson is equally comfortable talking about van Eyck's inscriptions (and signature) in Leal Souvenir as he is about the more subtle iconography seen in portraits by Lorenzo Lotto. This essay is a thoroughly rewarding experience, successfully forming a unified contemplation of the what these works reveal about the sitter and the artist. Lorne Campbell's essay, Making Portraits is a journey into the artistic process. Exploring the practises of artists and their workshop, using case studies from the exhibition and beyond, Campbell provides a useful summation of the range of methods employed by artists to create a human likeness. 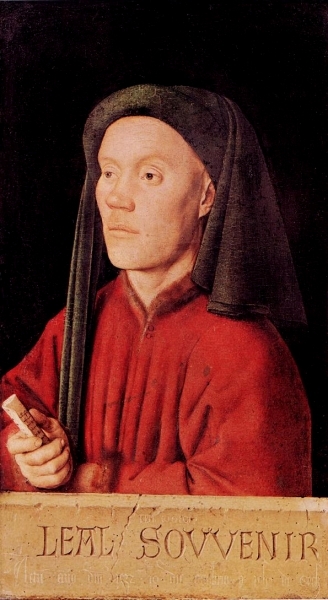 Campbell is perhaps most well-known for his work identifying the subjects of van Eyck's Arnolfini Portrait. The practical aspects of portraiture can be a dry, technical subject, but Campbell manages it in an eloquent way, including historical and social context - not as resonant as Syson's piece perhaps - but present nonetheless. Jan van Eyck and the other outstanding European portrait painters of the fifteenth and sixteenth centuries were a long way from being 'photographically accurate'. Nor did they use concave mirrors or other machinery to help them make objectively truthful images. Though completely capable of counterfeiting nature, when they chose and without mechanical help, they aspired to go much further. They edited and distorted some of the components of the natural world in order to give their paintings and likenesses greater and more immediate and expressive impact: to make them more vividly memorable and incisively critical. This clear statement of position on the increasing body of work being done by artists, mathematicians and optical scientists looking at painting technique, particularly during the Renaissance and Baroque, seemed to consume Campbell's otherwise remarkable essay. It is relevant to the process of making portraits, but seems amiss stated as fact. Campbell's gripes with these methodologies are perhaps best left to other volumes. The latter two essays are refreshingly devoid of personal agendas and art historical biases. They examine the role of portraits expressed in various media in a functional sense and a consideration within the historical record. Using the example above, regardless of how much of Lotto is in his Odoni portrait, there was a gentleman by this name whom paid Lotto for this portrait - complete with motifs that only he and his erudite circle could understand. Some of the items in the portrait, from the tablecloth to the Diana of Ephesus figurine were in Odoni's collection. The fact that there are discrepancies between reality and the artistic product is a constant theme in each of the essays and the catalogue descriptions proper. Miguel Falomir's essay, The Court Portrait is the most historically rich - tracing the development of portraits in the most prominent Courts of the Renaissance, from Urbino to Istanbul. It is a great counterpoint to Jennifer Fletcher's essay on Functions, Uses and Display of Renaissance Portraits. An important part of nuptial exchanges between powerful houses, or to glorify the practises of those involved in commerce. The role of the Renaissance portrait was many and varied - some uses echoing into modern forms of photography. Despite this, the ephemeral and contemplative nature of allegory has increasingly less prominence in a modern photo portrait taken for a wedding or special event. Not all portraiture was about the rich and powerful. 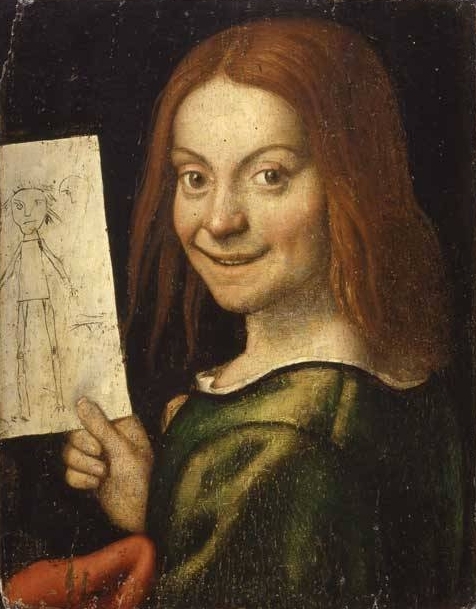 Echoing Nicholas Penny's comments of seeing elements of our own life echoed centuries ago is one of the lesser known gems of the exhibition, Caroto's fascinating depiction of a child holding a drawing. Closer examination will reveal a finely drawn eye on the Right hand side of the paper - the suggestion being that the child has taken the artist's sketch and added his own contribution. The frowning figure childishly drawn could in fact be a suggestion of the artist himself. It is a playful piece, far removed from the serious poses seen in most portraits of this time. Renaissance Faces is a fascinating catalogue that offers both a textual and visual summary of the range and development of portraiture in the fifteenth and sixteenth centuries. The four essays exploring social, technical, functional and historical modes of portraiture are an enthralling account of artisans' efforts to represent the human likeness. *This famous portrait at the NGL is assigned to Hans Holbein the Younger, during his first visit to England between 1526-8. The figure depicted is believed to be Lady Alice Ashby Lovell, whose familial coat of arms was noted to include squirrels. The interpretation of the starling is divided between a more literal reference to a potential family connection (The Lovell family were from East Harling), and an allegorical sense. Argh! That young boy is seriously creepy looking! 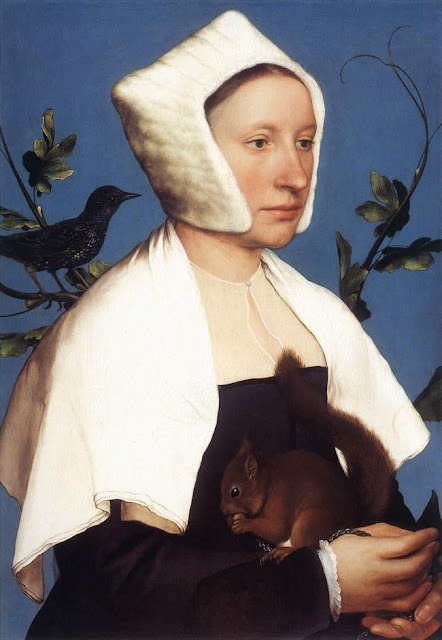 Love Holbein though. Hi Juliette. Many have that reaction! Caroto's figures are often described as disconcerting in appearance - he depicted noblewomen and the virgin in similar distorted fashion. In this respect he very much anticipates the style that followed the Renaissance known as Mannerism - which featured increasingly less naturalistic depictions of the human form. Great review of the catalog. I wish I could have seen the exhibition! Even by just reading your blog post, I could tell that some of the leading scholars on Renaissance art contributed to the catalog. By any chance, did you view the DVD that accompanied the exhibition? I'm curious to know what was on the DVD - a documentary of some sort? @M - I don't have the DVD at this stage, but am trying to track down a copy. It can be purchased from the NGL (online) store. NGL videos, such as the one that accompanied the Raphael exhibition - from Urbino to Rome (which you can find an excerpt of at 3PP) are definitely informative, but can be a bit dry. Very nice review, and it sounds like a fascinating catalogue. I find the medals especially intriguing, along with those paintings that respond to the look of medals in one way or another--e.g. Botticelli's "Portrait of a Man with the Medal of Cosimo de Medici the Elder." Cheers Ben - that Botticelli work is a great example of a crossover piece highlighting the role of portraits and medals to display familial or commercial allegiances. The identity of the sitter in that Uffizi piece is not conclusively known, but their fidelity to the Medici has survived the ages! Fascinating as always. And yes, that portrait of the boy is jarring in the extreme!